by Dr. Christopher Chang, last modified on 11/8/18. If the patient is a child younger than 5 years old, click here for more information. "I can't breathe through my nose mainly one side." Answer: Deviated septum is most common cause. Treatment is surgical. "I can't breath through one side of my nose when I lay down on that side. When I turn, it opens up, but than the other side gets blocked up." Answer: Turbinate hypertrophy is the most common cause. Treatment is ideally surgical, though some medications such as steroid, atrovent, or antihistamine nasal sprays may be helpful. "I can't breath through my nose whenever I lay down. When I stand up, I can breath again." "I can't breathe through either side very well all the time." Answer: Allergies, turbinate hypertrophy, deviated septum and/or adenoid hypertrophy may all be playing a role. Treatment depends on examination findings and may include medications and/or surgery. If this has been slowly getting worse with time, nasal polyps is something to check for. Rhinitis medicamentosa is possible if one has been using nasal decongestant sprays frequently. "I can't breathe through my nose only during the spring and fall." Answer: Well, allergies is the most common cause and treatment is predominantly through medications. Underlying turbinate hypertrophy or deviated septum may make the baseline symptoms worse. "I have a cold right now and have terrible nasal congestion and can't breath through my nose at all." Answer: In this scenario, turbinate hypertrophy along with generalized nasal mucosal lining swelling is the reason. Treatment really is time and medications to help with the symptoms until the cold passes. Rhinitis medicamentosa is possible if one has been using nasal decongestant sprays frequently. "I can't breath through my nose very well and it has been slowly getting worse over time. I also have difficulty smelling and tasting foods." Answer: In this scenario, nasal polyps is likely, especially if allergies are also present. Rhinitis medicamentosa is possible if one has been using nasal decongestant sprays frequently. "My nose is very narrow and when I try to breath in quickly, the sides of my nose collapse inward preventing me from breathing through my nose very well unless I inhale very slowly." 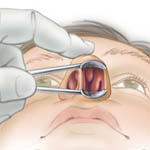 Answer: In this scenario, the problem may be due to a narrow internal nasal valve. This surgery traditionally requires a functional rhinoplasty in which the narrow nose is widened. Watch a video to see how this may be corrected here. 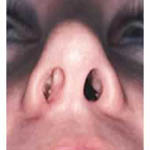 However, a non-invasive treatment called Vivaer can also address a narrow internal nasal valve. If nasal obstruction or congestion is affecting your life, please call our office for an appointment. Is Suppressing a Sneeze Bad For You? Working in a Salon Can Be Unhealthy for Your Nose and Throat! With A Deviated Septum, Why Does Nasal Obstruction Come and Go?